INSEAD, the business school for the world, today announced the reinstatement of its Chinese name 欧洲工商管理学院 (European Institute of Business Administration). The historical name will support the school’s expansion of activities and growth in Greater China and key strategic markets in Asia. Displayed as “INSEAD 欧洲工商管理学院”, the Chinese name encapsulates the true essence of INSEAD as a global business school with distinctive European roots. INSEAD has seen growing engagement in Greater China, demonstrated by a strong uptake of Executive Education Programmes by Chinese executives, a significant increase in Chinese participants in both its MBA and EMBA programmes, and a strengthened alumni presence. In 2007, only 2.6 percent of INSEAD’s MBA participants were from China. 10 years on in 2017, Chinese make up 9.4 percent of the total MBA programme enrollment, making them the second largest group of participants by nationality. In 2016, INSEAD furthered its commitment in China by renewing its partnership with Tsinghua University School of Economics & Management (Tsinghua SEM) for the Tsinghua-INSEAD Executive MBA (TIEMBA) Programme. Established in 2006, TIEMBA’s strong performance on globally-recognised rankings highlights the achievements of our faculty and alumni as well as the success of this partnership. INSEAD alumni in Greater China have also established stronger presence and increasing engagement with the school. In China and Hong Kong alone, INSEAD has more than 1,500 alumni who connect frequently for lifelong learning and networking opportunities. In addition, the first ever INSEAD Alumni Forum Asia, an annual flagship event for alumni, faculty, influential thinkers, business leaders and policy makers, was selected to be held in Shanghai in 2013 thanks to its robust alumni community. This year, the INSEAD Alumni Forum Asia will be held in Hong Kong in November. 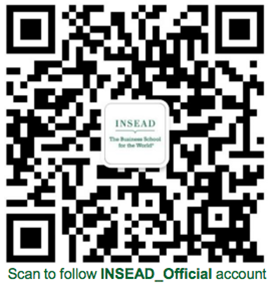 To further enhance INSEAD’s presence in Greater China and beyond, the school has officially launched its WeChat account. The integrated and interactive platform will enable INSEAD to share timely institutional news, thought-leading faculty research and articles, innovative degree and executive education programmes and offerings, as well as to increase the school’s engagement with its alumni and wider community in the region.